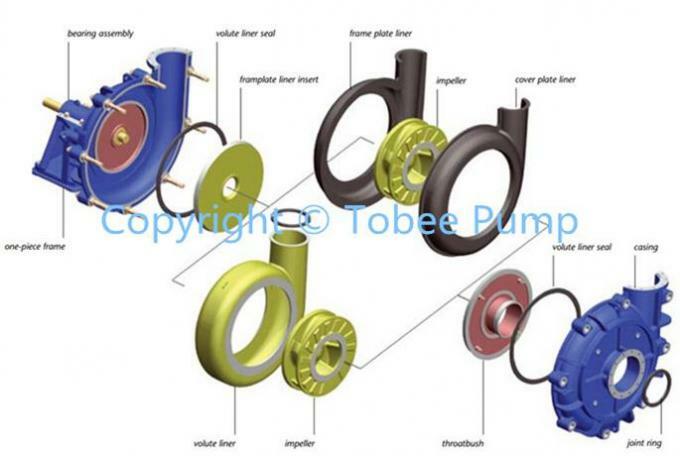 Tobee™ Slurry Pump Spare Parts namely the pump parts have direct connection with slurry, are very crucial to the service life of slurry pumps. 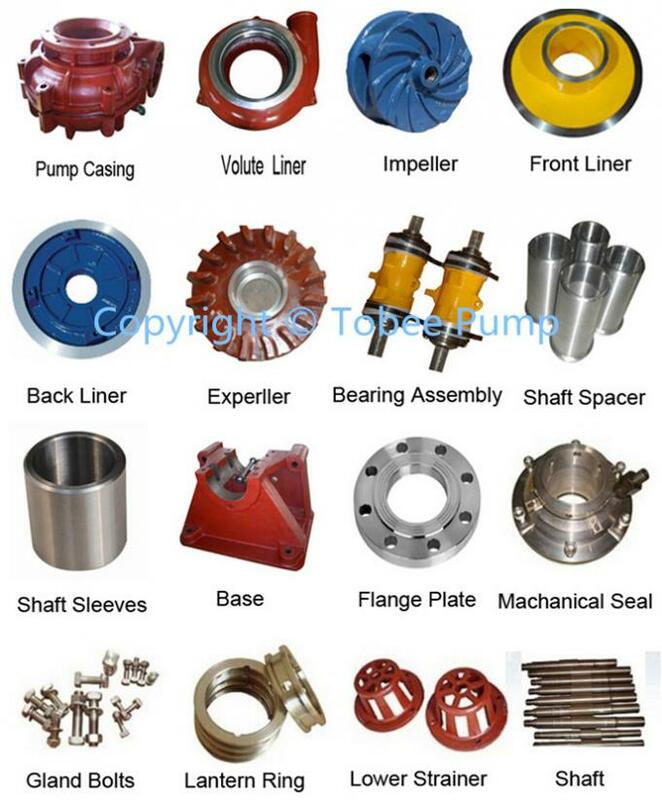 The wet parts, include impeller, liner, throatbush, frame plate liner insert, casing, etc., are very easily worn-out components because they work under longtime impact of abrassive and corrosive slurries in the high speed. 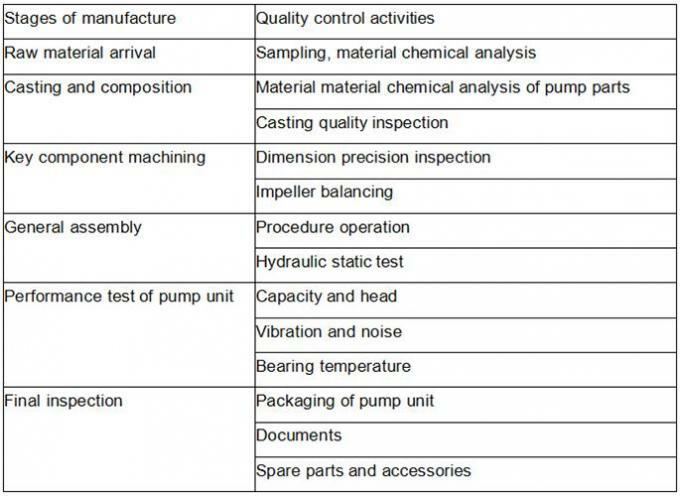 For the long service life of pump parts, the material plays an important role here.. Bearing assembly--A large diameter shaft with short overhang minimizes deflection and contributes to long bearing life. Only four through bolts are required to hold the cartridge type housing in the frame. Liners--Easily replaceable liners are bolted, not glued, to the casing for positive attachment and ease of maintenance. Hard metal liners are completely interchangeable with pressure molded elastomers. Elastomer seal rings back all liner joints. Casing--Casing halves of cast or ductile iron with external reinforcing ribs provide high operating pressure capabilities and an extra measure of safety. Impeller--front and rear shrouds have pump out vanes that reduce recirculation and seal contamination. Hard metal and molded elastomer impellers are complete interchangeable. Cast in impeller threads require no inserts or nuts. High efficiency and high head designs are also available. Throatbush--Wear is reduced and maintenance simplified by the use of tapered mating faces to allow positive accurate alignment during assembly and simple removal. 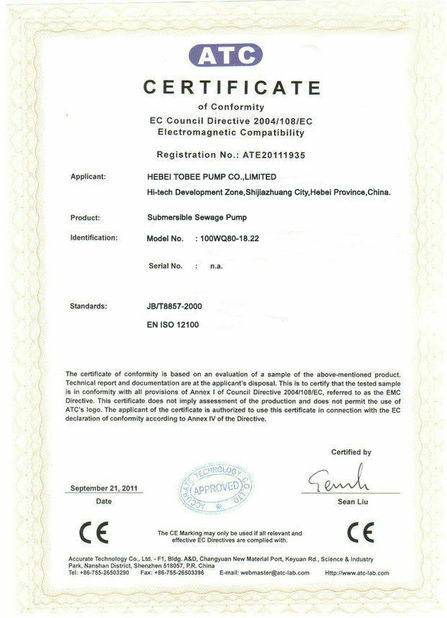 As the slurry pump wet ends parts such as the impeller,volute liner,FPL insert,Throat bush are consumption parts and we could provide you always the qualified slurry pump parts within very short time. 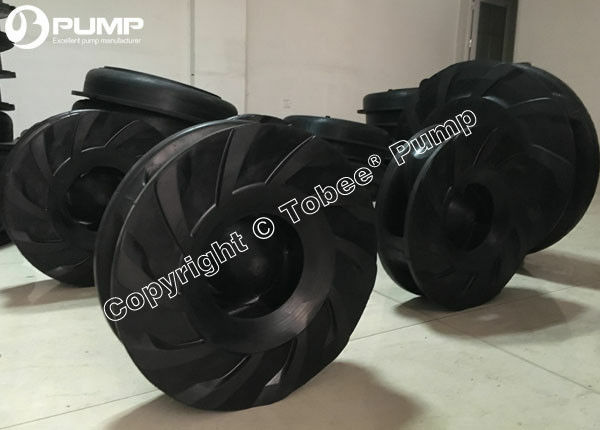 Considering the order pump size and we could provide case or pallet as per your need to make sure it safe enough during the long distance road and ocean shipping.have its own export company and so we could help you find the best ocean shipping solution and service for you from the goods out of factory to your destination. 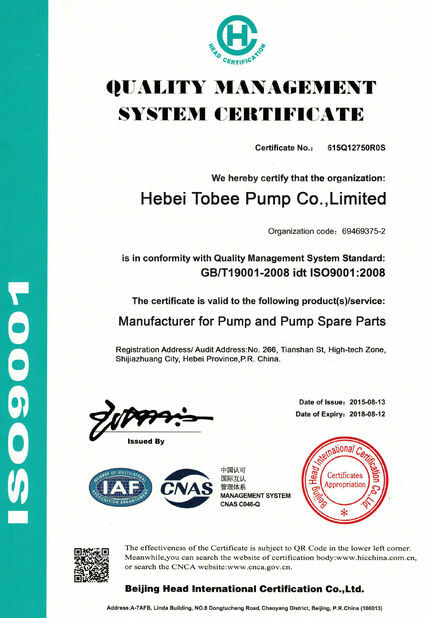 Tobee Pump have more than 30 years experienced pump installation workers and are very aware of any onside application.We could provide abroad pump installation service and expect pump manufacturing and sales,abroad pump installation is getting more and more popular by our regular clients abroad. 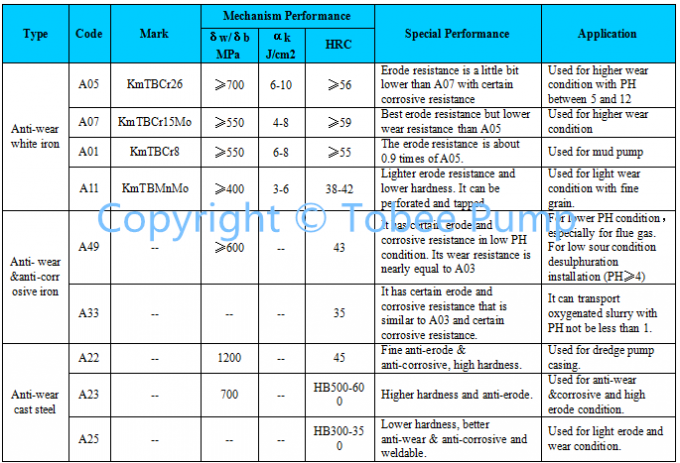 Technical data sheet,Performance curve,General arrangement drawing,Operating manual will be sent within 24th for your checking, So Pls feel free to contact us If you have any need. 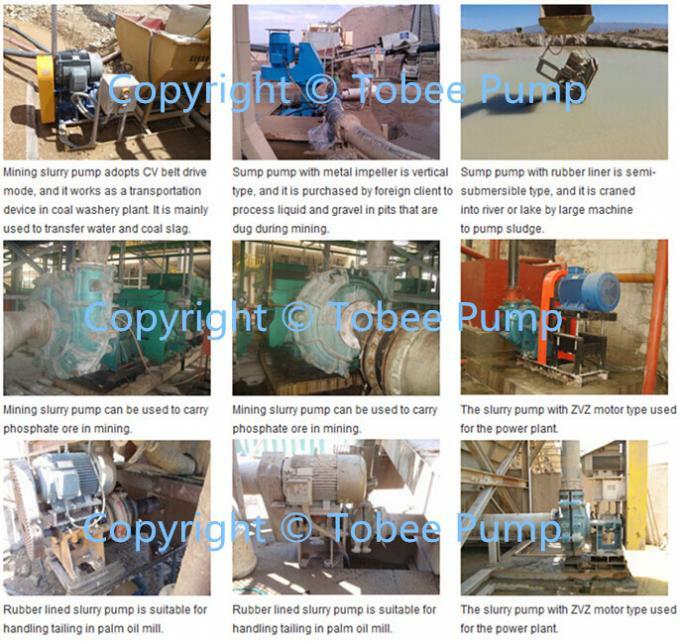 1)Mine:Black, non-ferrous ore slurry material pump and all kinds of concentrate and tailings conveying. 2)Metallurgy:Transport various slurry for aluminium or steel manufacture. 3)Coal: Coal mining, washing and various coarse and fine coal slurry transportation. 4)Electricity:Remove power plant ash,wash ash,various ash dregs or ash slurry transportation. 5)Construction materials:Various mud sand slurry(such as Cement slurry) transportation. 6)Chemical: Phosphatic fertilizer or potassic fertilizer factory various abrasive slurry trasportation. 7)Water conservancy:Lake,river dredge, sediment,grit, High plastic clay Suction line to transportation. A:Our factory is located in Shijiazhuang City, Hebei Province, China.You can fly to Shijiazhuang airport directly.All our clients, from home or abroad, are warmly welcome to visit us! A: The material is High chrome alloy or Rubber. We can also choose material as customers’ requirement. A:"Quality is priority. we always attach great importance to quality controlling from the very beginning to the very end. Our factory has 15~20QC.